Welcome to our web of International Programmes of IES Marratxí! Here you will find all the information updated relative to cultural exchange for School education and Erasmus+ for Professional Training. We use different languages: Catalan and Spanish, our official ones, English and Italian. The language of each page will depend on whom it may concern. We would like to give some details about its structure: in “Educacio Escolar / School Education” there is all the information relating to cultural exchanges and an updated agenda: “dia a dia”. On the other hand, in “Formació Professional/Vocational training”, you will find everything relating to the Erasmus+ KA102 project. From 25th April to 2nd May. 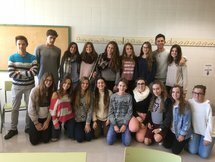 12 students of 3r ESO from Gymnasium-Frauenlob visit our school. Monday 19th December at 6pm Room 14. Meeting with 1r BTX parents and students to inform about the cultural exchange with Colchester, UK. Next 19th and 20th December in Madrid: "Jornadas anuales de difusión ERASMUS". 26th October. Meeting with "1r BTX" parents and students to inform them about next cultural exchange with United Kingdom. For further information click here. 22nd October. 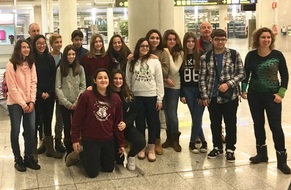 "3r ESO" students will visit Frauenlob-Gymnasium (Mainz, Germany) from 10th to 18th December 2016. For further information click here. 17th October. Meeting with "3r ESO" parents and students to inform them about next cultural exchange with Germany. 26th September uploaded some documents ​about "European Voluntary Service"
"Alumnos y alumnas del IES Marratxí realizan un viaje de intercambio cultural a Italia". Published on "diariodemarratxi.com" on 3rd June 2016.